Grampians Retreat is a secluded bush sanctuary near Dunkeld, so close, yet a world away from your everyday. It offers the perfect getaway for family or friends reunions, corporate seminars and special interest groups. Grampians Retreat specialise in hosting environmental groups, school camps and international visitors. Guests laze by the pool in summer, watch wallabies graze, listen to a myriad of birds and enjoy campfire nights under starry skies. 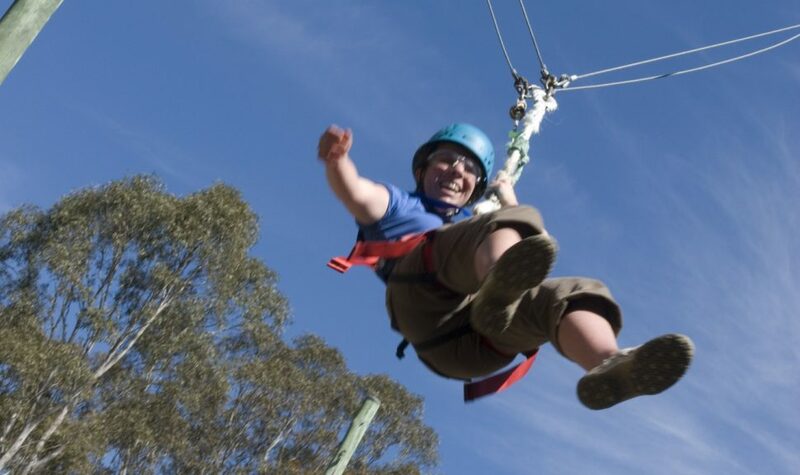 Recreation camps provide thrills on the giant swing, while archery and mountain bike riding are among other adventures to be sampled. Overnight or longer expeditions take adventurers to wilder places. Enjoy generous country style meals or choose self catering. Cabins are affordable and cosy, alongside facilities well placed for celebrations, Christmas gatherings or end of year functions. Grampians Retreat, also known as Base Camp, Mt. Abrupt, has hectares of bushland and river flats. The new Grampians Peaks Trail, a wilderness hiking adventure is at the doorstep. Grampians National Park is our playground, a richly bio-diverse environment, with spectacular scenery and Aboriginal cultural sites.